James DeMeo, Ph.D, University Of Kansas (retired). Well the Ph.D. is for real, and it is from the University of Kansas, where James got his Ph.D. in 1986, but other than that Cato is writing science fiction. DeMeo's CV says that while he was a graduate student at Kansas he was an instructor. Wanna bet he was a Teaching Assistant. DeMeo has been investigating the work of the late Dr. Wilhelm Reich since 1970, and founded OBRL in 1978. With cooperative assistance from a network of professionals and institutes supportive of Wilhelm Reich's original discoveries, OBRL has grown to become one of the world's primary centers for genuine and uncompromised research and educational programs focused upon Orgonomy, the science of orgone (life) energy functions in nature, as developed by Reich in the first half of the 20th Century. Starting in 1977, as part of his graduate research at the University of Kansas, DeMeo undertook replication studies of Reich's biophysical research -- specifically, a systematic evaluation of the Reich cloudbuster which yielded positive results. The acceptance of DeMeo's work by the KU faculty constituted the first time any aspect of Reich's controversial biophysical research had been validated by peer-review within a mainstream academic institution. Through the organizational structure of OBRL, and with the cooperative assistance and support of many other individuals and groups dedicated to Reich's works, DeMeo has since directed field applications of the cloudbuster apparatus, successfully ending droughts across the USA and overseas as well, with applications towards reducing the energetic stagnation characteristic of wetter regions suffering from chronic air pollution and forest-death. Seed Sprouting Inside the Orgone Accumulator”, Journal of Orgonomy, 12:253-258, 1978. “On the Question of a Dynamic Biological-Atmospheric-Cosmic Energy Continuum: Some Old and New Evidence”, Abstracts, 11th International Congress of Biometeorology, Purdue University, September, 1987. “Regarding the Article: ‘A Close Look at Therapeutic Touch’ in Journal of the American Medical Association (April 1998, pp.1005-1010)”, Bridges, Magazine of the Int. Society for Study of Subtle Energy and Energy Medicine, 9(1):16, Spring 1998. Debated hordes of socialist students and outright minions of the Socialist Workers Party about the war in Vietnam. Use of the draft in an undeclared war is wrong. Socialism, whether fascist or communist, is the childish product of vile envy and the enemy of the rights of the individual. Given that the issue stirring those hordes and minions at the time where this guy was, was the draft, and he himself was dodging at the same rate given this statement, comic dissonance has once again reared its amusing head. (a) Elevated levels of paranoia, or Conspiracy Syndrome. (a) Frequent and fevered claims to the effect of "a cold atmosphere can't warm a hotter surface". (b) Frequent references to the 2nd law of thermodynamics. Within the first week of infection an infected individual can become highly infectious as they propagate the meme to those around them. Treatment: Recommended treatment involves sustained application of logic to the infected individual. If symptoms still persist after 24 hours of treatment this is usually a sign that the infection is permanent and there is no known cure. Warning signs of permanent infection include rapid switching in the obfuscation cortex leading the individual to discover confusion over words such as "warms", "heats" and "net". Do you know someone with GED? Denial Anonymous can help. GCM’s are often referred to as General Circulation Models, which replicate from first principles the statistical description of the large-scale motions of the atmosphere and ocean. In modern times, where circulation is only one component in modeling exercises, GCM’s are more broadly defined as Global Climate Models. Climate models range in complexity from basic energy-balance models where solutions can be worked out by hand, to very sophisticated models that make use of some of the fastest and most powerful computers available. There is a broad range of physics and parameterizations included in GCM’s. Processes must conserve energy, momentum, and mass for example. Most GCM’s make use of primitive equations (USCCP 2008) which is a simplified form of the equations of motion. Use is made of the fact that the atmosphere is thin in comparison to its horizontal extent. Small terms in the momentum equations are generally neglected. Modern GCM’s have evolved tremendously over the decades following increased computing power and our understanding of the processes relevant to global climate. Improvements include increases in atmospheric resolution, height of the model top, sea ice dynamics, representation of atmospheric chemistry, improved cloud microphysical schemes, modeling of the terrestrial biosphere and vegetation interactions with climate, among other things (Schmidt et al 2006; Randall et al 2007). Many realistic factors of global climate emerge from the fundamental physics including ocean and atmospheric “modes” and oscillations, displacement of storm tracks and jet streams, heat transport mechanisms, and climate feedbacks as a response to warming (USCCP 2008). How well a model performs depends on what climate variable you are interested in (e.g., temperature, precipitation, sea level rise, humidity patterns), the statistics (e.g., trends, extremes, variability), as well as the spatial and temporal scales of interest (Knutti 2008a). Further, various models perform better for different questions than other models. Perhaps if Gerlich and Tscheuschner (2009) made their model criticisms too specific, they know it would be that much easier to invalidate. Detection involves the processes whereby a change in climate can be identified against the background noise of natural variability, and Attribution allows one to assign causes to that change with some level of confidence. The ability to hindcast the time-evolution of the 20th century climate change (e.g. Meehl et al 2004) as well as realistically past climates (e.g. the Last Glacial Maximum) with standard radiative forcing and feedback concepts gives confidence in our understanding of the essential features governing global climate (Randall et al 2007; USCCP 2008). For example, the NASA GISS climate model was used to make a prediction of the global cooling that followed the 1991 Mt. Pinatubo volcanic eruption (Hansen et al 1992). The predicted global cooling as well as the recovery back to the ongoing global warming was well simulated. Successful climate prediction involves understanding how radiative transfer is affected with changes in the solar luminosity, planetary albedo, or changes in atmospheric chemistry. This is because the radiative balance of the planet serves to define the basic boundary conditions which constrain the global climate. However, formal attribution involves comparing spatio-temporal patterns between observations and models, not the ability to simulate the amplitude of temperature change to a set of forcings (Knutti 2008b). There are many “fingerprints” of greenhouse-gas induced warming which include corresponding changes in the emission spectrum of longwave radiation (Harries et al 2001), stratospheric cooling, and decreases in the diurnal temperature gradient. These things have been both modeled and observed (Hegerl et al 2007). Anthropogenic causation as been detected in the world’s ocean heat content trends (Barnett et al 2001), atmospheric moisture content (Santer et al 2007), in the world’s biosphere (Rosenzweig et al 2008) and continues to provide a more consistent explanation of continental to global scale climate change than natural forcing alone. Despite their assertions, Gerlich and Tscheuschner (2009) have failed to show that this science is incorrect or in contradiction to known physics. (As part of Rabett Run's Gerlich and Tscheuschner project, Eli has started drafting parts of a response, which we will gift wrap in Bozo paper and send to some unsuspecting journal, but certainly arXiv. We have spent a lot of time being serious, but for the introduction/conclusion all may enjoy a snark break. The Editorial Board expresses its thanks for your patience =:> . Some of this comes from previous posts, some from Georg Hoffmann on Prima Klima and some from somewhere. Suggestions for changes and additions are welcome. Gerlich and Tscheuschner  have published a polemic in the International Journal of Modern Physics B, full of error, irrelevancy, and accusation. Long known from its arXiv versions and well refuted, it is difficult to understand how their work could appear in a respected journal, however, recent history has shown that such papers are occasionally published where editors and referees are not familiar with the underlying science, or themselves are outliers with respect to the field in which the paper lies. This is often the case where expertise in one area is generalized to arrogance about another. A refutation is needed lest anyone be mislead. This comment will clearly demonstrate major errors in simple physics that Gerlich and Tscheuschner's make, invalidating their entire paper. Supplementary material deals with Gerlich and Tscheuschner's errors in detail. The first twenty or so pages of Ref. 1 are devoted to showing that the greenhouse effect has nothing in common with how a glass greenhouse works, a commonplace taught in and useful for every introductory atmospheric science course. A simple paragraph would have sufficed. Concisely, greenhouses work by restricting the outward flow of thermal energy by convection, the greenhouse effect limits the flow of thermal energy to space by radiation. The fundamental equations of radiative transfer have the Second Law of Thermodynamics built into them, via Kirchoff's Law, which can be derived directly from the Second Law. When solved numerically the solutions perforce obey the 2nd law. This applies equally well to simple models, and to the most elaborate line-by-line calculations. All show that the presence of greenhouse gases in the atmosphere results in a warmer surface than in their absence. Next, following Arthur Smith's criticism  of an earlier version of Ref. 1, we consider a non-uniform distribution of temperature on the surface of a planet. 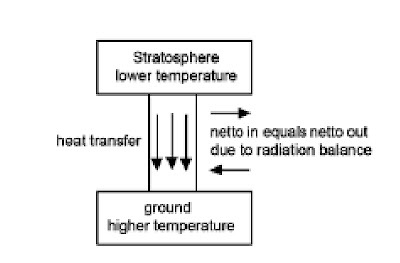 It is shown that when doing this, Gerlich and Tscheuschner obtain an absurd result by using a ridiculous assumption, that each part of the planet's surface immediately cools or heats to reach an equilibrium with the locally impinging solar radiation thereby neglecting the thermal inertia of the oceans, atmosphere and ground. Were this to be the case, all parts of the Earth would cool to well below 200 K (-73 C) at night. 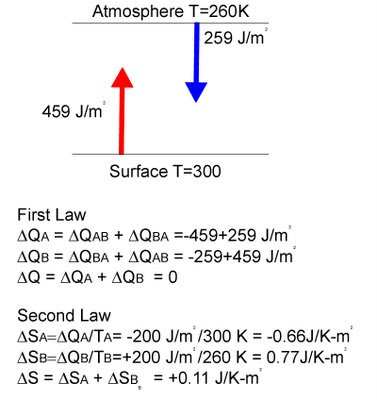 It is shown that a uniform surface temperature model provides a lower, but useful, bound on the greenhouse effect, the commonly quoted ~33 K.
These two points alone invalidate Gerlich and Tscheuschner's entire paper, and show that the radiative greenhouse effect does significantly increases the surface temperature of the Earth. Beyond this readers with basic understanding of physics and climate cannot help but be amused by the rich bounty of irrelevancies, silly errors, lack of understanding and significant omissions that Gerlich and Tscheuschner provide. Coupled with the authors' embarrassing false pride, the manuscript would pass from hand to hand labelled as a revenge of social scientists for Alan Sokol's joke, were it not for the demonstrated capacity of this paper to mislead the naive and those hungering to be mislead. It is only this that makes a reply necessary. Section 2 below disposes of Ref. 1's arguments about the second law of thermodynamics, principally laid out in their Section 3.9. As a part of that, in Section 3, simple models are introduced and then used to demonstrate Gerlich and Tscheuschner's aphysical picture of heat flow on a rotating planet (Section 3.7). (4) do not fit in the standard language of system theory or system engineering. It is legitimately hard to decide which of these four points is the most ridiculous. (1) and (2) might charitably be called querulous, demanding a full vector representation of all the heat/energy flows of a schematic representation. Gerlich and Tscheuschner might be pleased to know that the angular dependence of the heat flows is captured in radiative transfer and global circulation models (GCMs are commonly known today as global climate models, but originally were called global circulation models, and are built on fluid dynamics). GCMs solve the non-linear Navier-Stokes equation for fluid flow. Fig. 1 is not meant to be a GCM, but an illustration of the vertical thermal energy flow from the sun, the surface and in the atmosphere. Importantly, each of the energy flows has been linked back to experimentally measured global averages. (3) and (4) are risible. Why should representations of a total thermal energy flow require a Feynman diagram? Worse, how would such a Feynman diagram be constructed. (4) is the engineering equivalent. Finally the authors might reconsider their standard representations of heat engine (Fig 31 and 32 in  and Fig. 3 below) which uses the same sort of arrows. Less amusing are Gerlich and Tscheuschner's libelous attacks on others. Perhaps the most notable of these, is upon Stephan Bakan and Ehrhart Raschke for using Fig. 2. According to Gerlich and Tscheuschner, Bakan and Raschke's scientific misconduct was to scale the incoming solar and outgoing terrestrial radiation to the same size. Referring to Fig. 1, the outgoing terrestrial radiation at the top of the atmosphere is 239 W/m2 on average which is balanced by the amount of solar energy absorbed in the atmosphere and by the surface. With much hemming and hawing Ref. 1. arrives at about the same numbers. In other words, Bakan and Raschke took note of the observed energy balance to construct their figure. Gerlich and Tscheuschner are not only misleading, they are wrong on this point, and insulting to Bakan and Raschke. In Sec. 3.3.5, it was indicated how simple it is to falsify the atmospheric greenhouse hypotheses, namely by observing a water pot on the stove: Without water filled in, the bottom of the pot will soon become glowing red. However, with water filled in, the bottom of the pot will be substantially colder. In particular, such an experiment can be performed on a glass-ceramic stove. The role of the Sun is played by the electrical heating coils or by infrared halogen lamps that are used as heating elements. Glass-ceramic has a very low heat conduction coefficient, but lets infrared radiation pass very well. The dihydrogen monoxide in the pot, which not only plays the role of the “greenhouse gas” but also realizes a very dense phase of such a magic substance, absorbs the infrared extremely well. Nevertheless, there is no additional “backwarming” effect of the bottom of the pot. In the opposite, the ground becomes colder. This, of course, neglects the latent heat carried away from the pot and thus the heating element by evaporation of the water in the pot. Since it is well known that people who are physics obsessed are often forgetful, we postulate that the housewife forgets that she has put the pot on the range, and all the water boils away. At that point, when all the water has evaporated, measurements show that the heating element rises to a higher temperature than it was before the tea pot was placed on it. Ethon extends to Snack another opportunity for horror and shock or is that shock and horror? Constraining the carbon dioxide emissions at their present level would deliberately kill at least 2 billion people - mostly children – before the middle of this century. And reducing the emissions would kill more millions – possibly billions – of people. This would be genocide of a magnitude not previously possible in all human history. Ethon eagerly awaits a declaration from the usual suspects that this is beyond the pale. BTW, read, or skim the thread, it is a good example of where the public discussion is going and how opposing the denialists with the two pronged attack of ridicule and science works and why it is important to have publicly accessible detailed information on the science in a quotable form. All three elements are needed. Back now to our regularly scheduled program. This is not too far from how real radiative transfer codes work, with the caveat that here only two "gray" layers are considered. For simplicity, we assume that the atmospheric layers are opaque to infrared radiation, absorbing all terrestrial IR radiation, and emitting like a blackbody at their temperatures. This simplified atmosphere is also fully transparent to incoming solar radiation. An atmosphere with large infrared optical depth can be approximated with two layers centered at 0.5 and 2 km altitude (Goody and Walker 1972). With or without considering convection or latent heats associated with the condensation of water vapor, the clear effect of the atmosphere is to make the surface temperature much higher than the effective temperature at which it radiates to space. These layers introduce another aspect to the supply of energy at the surface, which now is not only heated by the sun, but also by the downward emission of terrestrial radiation from the atmosphere. This term is larger than the incident solar radiation at the surface by a factor of roughly two in the global mean. Most of this terrestrial radiation originates in the lower atmosphere where water vapor is very abundant. As shown by the spectrum below the down welling radiation has been measured directly, again contrary to the assertions of Ref. 1. In this spectrum, taken at the pole, one sees the influence of water vapor as the sharp lines, mostly at the left, low frequency end, CO2 between 600 and 800 cm-1, and ozone at about 1100 cm-1. Gerlich and Tscheuschner (2009) are correct to conclude that this greenhouse mechanism does not act in the way real greenhouse acts, whereby convection is restricted, however this is a strawman, a strawman that occupies over 20 pages in Ref 1. No serious explanation of the greenhouse effect neglect the role of radiation and how it is suppressed with increased infrared opacity. On Earth, absorption and re-radiation of infrared energy is the reason why the actual surface temperature is much higher than that of the effective temperature. Although scattering of infrared light is not a significant term for the Earth's atmosphere, it can matter in other planetary cases such as Venus or past conditions on Mars (e.g., Forget and Pierrehumbert 1997). A while ago Eli went to the mattress with Atmoz over blankets. It was pointed out that there are styles in science and the bunny's is to do illustrative experiments. If they carry Darwin credit, so much the better. It's not for nothing that chemistry is called stinks and bangs and physics shocks and explosions. If we wanted to play safe we would have taken up financial futures. Which, come to think of it, is what the theoreticians did in case you have any questions about why the world is in an economic mess. Eli will rewrite this for the G&T response, and there are some refinements that have to be made (for one thing we have to measure the temperature of the upper and lower surfaces of the glass) and it has to be done in vacuum, just as gravityloss pointed out, also take a look at the blanket wars posts) but he thought some would be interested. The lab bunnies started with a heating plate, fed at ~40 VAC through a Variac. Eli placed a couple of thin glass tubes on this and a large glass plate about the some size as the heating plate on top of that. You have to look carefully to see the plate, but you can find the greenish tinged edge. This heated up to ~166 C at equilibrium. Couple of caveats. The temperature varied ~2 C over 5-10 minutes, the thermocouple used to measure temperature is the blue wire to the left, the plate is a 2" diffusion pump heater, the glass tubes Pasteur pippets and the glass plate a large cheap lens from lord knows where. You use what you got. Eli then grabbed the glass plate with his hands (One of the skills you pick up after forty years in the lab is a certain ability to touch hottish things. Comes in handy in restaurants) and removed it. The temperature rapidly decreased to 151 C in a minute. BTW, Eli is insensitive, but he can't pick up anything much over 70 C without illegal asbestos glass blowers gloves. And here come the sun. . . The atmospheric greenhouse effect, an idea that many authors trace back to the traditional works of Fourier (1824), Tyndall (1861), and Arrhenius (1896), and which is still supported in global climatology, essentially describes a fictitious mechanism, in which a planetary atmosphere acts as a heat pump driven by an environment that is radiatively interacting with but radiatively equilibrated to the atmospheric system. According to the second law of thermodynamics, such a planetary machine can never exist. Nevertheless, in almost all texts of global climatology and in a widespread secondary literature, it is taken for granted that such a mechanism is real and stands on a firm scientific foundation. In this paper, the popular conjecture is analyzed and the underlying physical principles are clarified. By showing that (a) there are no common physical laws between the warming phenomenon in glass houses and the fictitious atmospheric greenhouse effects, (b) there are no calculations to determine an average surface temperature of a planet, (c) the frequently mentioned difference of 33◦ is a meaningless number calculated wrongly, (d) the formulas of cavity radiation are used inappropriately, (e) the assumption of a radiative balance is unphysical, (f) thermal conductivity and friction must not be set to zero, the atmospheric greenhouse conjecture is falsified. (1) There are no common physical laws between the warming phenomenon in glass houses and the fictitious atmospheric greenhouse effect, which explains the relevant physical phenomena. The terms “greenhouse effect” and “greenhouse gases” are deliberate misnomers. (c) with or without infrared light absorbing gases. The frequently mentioned difference of 33◦C for the fictitious greenhouse effect of the atmosphere is therefore a meaningless number. (3) Any radiation balance for the average radiant flux is completely irrelevant for the determination of the ground level air temperatures and thus for the average value as well. (4) Average temperature values cannot be identified with the fourth root of average values of the absolute temperature’s fourth power. (5) Radiation and heat flows do not determine the temperature distributions and their average values. (6) Re-emission is not reflection and can, in no way, heat up the ground-level air against the actual heat flow without mechanical work. (7) The temperature rises in the climate model computations are made plausible by a perpetuum mobile of the second kind. This is possible by setting the thermal conductivity in the atmospheric models to zero, an unphysical assumption. It would be no longer a perpetuum mobile of the second kind, if the “average” fictitious radiation balance, which has no physical justification anyway, was given up. (8) After Schack (1972), water vapor is responsible for most of the absorption of the infrared radiation in the Earth’s atmosphere. The wavelength of the part of radiation, which is absorbed by carbon dioxide is only a small part of the full infrared spectrum and does not change considerably by raising its partial pressure. (9) Infrared absorption does not imply “backwarming.” Rather, it may lead to a drop of the temperature of the illuminated surface. 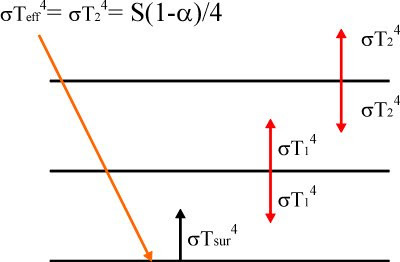 (10) In radiation transport models with the assumption of local thermal equilibrium, it is assumed that the absorbed radiation is transformed into the thermal movement of all gas molecules. There is no increased selective re-emission of infrared radiation at the low temperatures of the Earth’s atmosphere. (11) In climate models, planetary or astrophysical mechanisms are not accounted for properly. The time dependency of the gravity acceleration by the Moon and the Sun (high tide and low tide) and the local geographic situation, which is important for the local climate, cannot be taken into account. (12) Detection and attribution studies, predictions from computer models in chaotic systems, and the concept of scenario analysis lie outside the framework of exact sciences, in particular, theoretical physics. (14) Higher derivative operators (e.g., the Laplacian) can never be represented on grids with wide meshes. Therefore, a description of heat conduction in global computer models is impossible. The heat conduction equation is not and cannot properly be represented on grids with wide meshes. (15) Computer models of higher dimensional chaotic systems, best described by nonlinear partial differential equations (i.e., Navier–Stokes equations), fundamentally differ from calculations where perturbation theory is applicable andsuccessive improvements of the predictions — by raising the computing power — are possible. At best, these computer models may be regarded as a heuristic game. (16) Climatology misinterprets unpredictability of chaos known as butterfly phenomenon as another threat to the health of the Earth. He missed on that last one. Eli wants arguments with references, experimental data and theoretical calculations. You too can be a published author. Their name in Minsk is cursed, cause they found out who published first (and second). The average text similarity between an original article and its duplicate was 86.2%, and the average number of shared references was 73.1%. However, only 47 (22.2%) duplicates cited the original article as a reference. Further, 71.4% of the manuscript pairs shared at least one highly similar or identical table or figure. Of the 212 duplicates, 42% also contained incorrect calculations, data inconsistencies, and reproduced or manipulated photographs. "I have no statement. I cannot prove that this is plagiarism. Even if it is, what can be done?" "I would like to offer my apology to the authors of the original paper for not seeking the permission for using some part of their paper. I was not aware of the fact I am required to take such permission." "There are probably only 'x' amount of word combinations that could lead to 'y' amount of statements. … I have no idea why the pieces are similar, except that I am sure I do not have a good enough memory--and it is certainly not photographic--to have allowed me to have 'copied' his piece…. I did in fact review [the earlier article] for whatever journal it was published in." "Looks like [the author of the later article] did it again in 2001. This example is a bit more embarrassing because the author of the original paper is [the] editor of the journal where [the author of the later article] published the copied work. Looks like we will have to publish two retractions." The Hubbert curve was introduced by, Hubbert, M. King. It predicts that production of any natural resource will follow a bell shaped curve, a reasonable idea. The background is that the yield individual exploitable deposits ranges from a little bit in very rich digs to a lot in poor ones. At first before demand has grown, the rich deposits are mined, as demand grows, the more common medium size lodes are mined, but we get better at it so the net production increases until finally only the really lean stuff is left and production falls as the cost per unit soars. The result is that production as a function of time follows a bell shaped curve. The idea took off when Hubbert predicted the peak production of oil in the US. Rutledge estimates that 90% of coal reserves will be gone by 2070 (he says 2069, but that is engineer speak). Other groups put peak coal at 2020. In any case what is left after 2070 is gonna not be very good. You can, if you try hard enough burn dirt, which is what the Germans do with brown coal. First the good news, if coal reserves are a factor of four or less than estimated, burning coal will bring us into a dangerous area, 3 C higher temperatures, but not necessarily a disastrous one. The bad news is tar sands and shale. Ethon has been using a lot of mouthwash, waiting with baited breath on the Front Range, for the indignation coming out of Colorado. Wanna bet he's gonna be waiting a long time? Steve Bloom and Hank Roberts pointed me towards this article in The Register, which has been splashed all over the septic end of the bogusphere (I think I'll adopt that typo). I'm relieved to find that it's all a fuss about nothing. The "report" is simply the collation of one of these popular-but-pointless sceptic-vs-scientist debates, and has no official status. The various documents surrounding it are here on the JSER front page (only in Japanese), just below the headline "Global warming: What is the scientific truth?". The pdf labelled 本文 is the main report. The articles immediately under that are various documents by two of the contributors, Kiminori Itoh (伊藤) and my colleague Seita Emori (江守), who was the only climate scientist involved in the event and who tried to present the scientific case but was obviously rather outnumbered. Those documents have some pictures in so may be partially readable, even to non-Japanese readers. You may notice a citation or two for yours truly. "I believe the anthropogenic (man-made) effect for climate change is still only one of the hypotheses to explain the variability of climate," Kanya Kusano told The Weekend Australian. It could take 10 to 20 years more research to prove or disprove the theory of anthropogenic climate change, said Dr Kusano, a research group leader with the Japan Agency for Marine-Earth Science's Earth Simulator project. "Before anyone noticed, this hypothesis has been substituted for truth," writes Shunichi Akasofu, founding director of the University of Alaska's International Arctic Research Centre. The inspector general for the Commerce Department is trying to force a prominent environmental group to reveal who leaked the Bush administration's plans to weaken the Endangered Species Act just weeks before President Barack Obama took office. The investigation was triggered by Sen. James Inhofe of Oklahoma, senior Republican on the Committee on Environment and Public Works. The case suggests that, under at least certain circumstances, the government will continue to pursue and identify federal employees who disclose sensitive documents about controversial U.S. policies—a common practice under the Bush administration. which is all over the environmental blogs, with some not very nice things being said about Zinser, let alone Inhofe. Will someone remind Eli why he has to be a nice bunny?